As you study English, I think it’s a good idea to know some of the basic terms that your English teacher may use in the class. As in any language, there are different types words in a sentence, and each word has a certain function or purpose in the sentence. 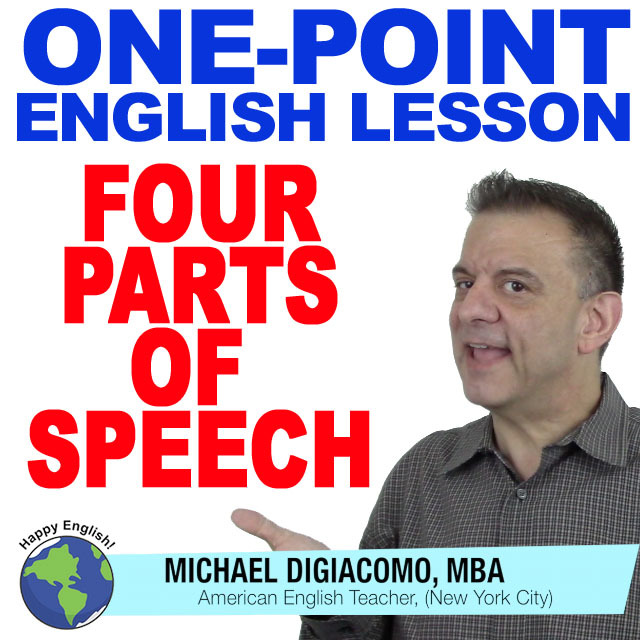 These are called “parts of speech.” For today’s free English lesson, I would like to show you four basic parts of speech in English. People: Jack, teacher, sister, friend, etc. Places: New York, park, garden, town, city, etc. Appearance: beautiful, strange, ugly, nice, etc. Size: small, large, round, square, tall, etc. blue pen, large house, interesting teacher, good friend, beautiful garden. Actions: run, walk, jump, talk, say, imagine, want, can, etc. run quickly, speak slowly, walk carefully, play gently. Knowing this vocabulary (noun, verb, adjective, & adverb) will help you understand how your teacher speaks. I hope you find this useful.